The world as we know it is more dynamic than it has ever been. The landscape of leadership has however not been restricted to any field of endeavour in particular. 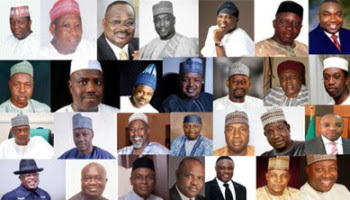 Although certain backgrounds tend to feature prominently, it is worth the while to know some bit of the academic background of the current serving governors in Nigeria. Dr. Okezie Ipkeazu, the governor of Abia state gained admission into the university of maiduguri in 1980 to study clinical biochemistry and graduated with a B.Sc (Hons) second class upper division in August 1984. Bindo jibrilla, the governor of Adamawa state is described as a successful business man who enrolled for a certificate program in business studies at the city college of higher education, London from 1984. by 1985, he proceeded to enrol for a diploma program in business studies at the same city college of higher education which he earned in 1986. Governor Udom Emmanuel of Akwa ibom state holds a bachelors degree (B.sc) in accounting from the University of Lagos in 1988 . Governor Willie Obiano of Anambra state holds a bachelors degree in Accounting from the prestigious University of Lagos in 1979. Barrister Mohammed A. Bello, the executive governor of bauchi state studied at Ahmadu Bello university (ABU) zaria from 1975 to 1978 where he got his LLB Hons. Governor Seriate Henry Dickson of Bayelsa state enrolled in the Rivers state University of science and technology(RSUST) port hercourt, to study law in 1988. he earned his LLB in 1992. Mr. Ortom Samuel, the governor of Benue state enrolled at the Ahmadu Bello University Zaria, and obtained both the interim joint matriculation board certificate in 1995 and a diploma in journalism in 1998. He also attended Benue state university, where he obtained the advanced diploma in personnel management in 2001. Governor Kashim Shettima of Borno state studied agricultural economics at the university of maiduguri, graduated in 1989. Governor Benedict Bengiousluye Ayade of Cross river state earned his B.sc (Hons) in Microbiology at Ambrose Alli university in Ekpoma from 1984 to 1988. Dr Ifeanyi Okowa of Delta state attended the university of ibadan (UI), where he studied medicine and surgery, graduating in 1981 with an MBBS degree. Governor Dave Umahi of Ebony state studied civil engineering in the Enugu state university of science and technology (ESUT) and graduated with a bachelor of science degree in 1982. Mr Godwin Nogheghese Obaseki, the governor of Edo state attended the University of ibadan (UI) where he bagged a bachelor of arts degree in classics. Governor Ayodele Fayose of Ekiti state attended the Polytechnic Ibadan where he did a programme in biological science/applied medical/biology and obtained a higher national diploma in 1987. Governor Lawrence Ifeanyi Ugwuanyi AKA 'gburugburu', holds bachelors degree in Business Administartion from University of Nigeria, Nsukka. Governor Ibrahim Hassan Dankwambo of Gombe state is a graduate of Ahmadu Bello University, zaria with a degree in Accounting which he obtained in 1985. Governor Owelle Rochas Anayo Okorocha of Imo state studied at the University of Jos, obtaining a diploma in Public administration and later returned to obtain an advanced diploma in public administration. Governor Mohammed Badaru Abubakar of Jigawa state is a graduate of Ahmadu Bello university, zaria. where he obtained a B.sc Accounting degree. Mallam Nasir Almad El-Rufai, the executive governor of Kaduna state studied Quantity surveying in Ahmadu Bello university zaria where he obtained bachelor degree with first class honors. Governor Abdullahi Umar Ganduje of Kano State obtained Nigerian certificae of education (NCE) from advanced teachers college kano between 1969 and 1972. he then attended Ahmadu Bello university (ABU), zaria for B.sc in education degree from 1972 to 1975. Governor Abubakar Atiku Bagudu of Kebbi state obtained a B.sc in Economics in the prestigious Usmanu Danfodiyo University, Sokoto. Governor Yahaya Bello of kogi state was admitted into Ahmadu Bello university, zaria in 1996, where he studied Accounting and graduated in 1999. Governor Abdufatah Ahmed of kwara state attended the school of basic studies of kwara state college of technology (now kwara state polytechnic), ilorin from 1978 to 1980. he went on to study chemistry in University of ilorin where he earned a B.Sc in chemistry. Governor Akinwumi ambode is an alumunus of University of lagos, where he studied Accounting, remarkebly, he graduated at the age of 21. Governor Umaru Tanko Al-Makura of Nasarawa state attended the Ahmadu Bello university, zaria from 1975 to 1978, graduating with a bachelor of education degree. Governor Abubakar Sani Bello of Niger state was admitted into University of Maiduguri in 1986 to 1991 where he obtained a B.Sc in Economics. Governor Oluwarotimi Odunayo Akeredolu attended university of ife (now obafemi awolowo university), where he studied law, graduating in 1978. Governor Abiola Adeyemi Ajimobi studied business administration and finance at the state University New york. buffalo, New York, graduating with a bachelor of science degree. Governor Simon Bako Lalong of plateau state studied law in Ahmadu Bello university zaria, graduating in 1990 with a bachelors degree in law. Governor Ezenwo Nyesom Wike of Rivers state studied law in the Rivers state university of science and technology. Governor Aminu Waziri Tambuwal of Sokoto state attended the Usmanu Danfodiyo University Sokoto, where he studied law, graduating with an LLB(Hons) degree in 1991. Governor Darins Dickson Ishaku of Taraba state studied architecture in the Ahmadu Bello University (ABU), Zaria where he obtained a bachelors degree in Architecture. Governor Ibrahim Geidam attended Ahmadu Bello University between 1981 to 1983 where he earned a diploma in accountancy and later returned to earn a B.Sc in accountancy degree in 1990. Alhaji Abdulazuiz Abubakar, the executive Governor of Zamfara state attended Sokoto Polytechnic from 1991 to 1994 where he obtained a certificate and later a diploma in secretarial studies in 2004.